After years of unsuccessfully seeking an agent for ANCIENT WRATH, I decided to try my luck by going directly to small, independent publishers. The first one I tried was Knox Robinson Publishing, which specializes in, among other things, historical novels, historical romance, and fantasies. They asked for my complete manuscript, and in short order offered me a contract. This is the dream of a lifetime, and, needless to say, I’m thrilled! I’m excited to have found Knox Robinson and impressed with the high quality of the books they publish. I’ve always been intrigued by the Phoenicians, and as soon as the plot for Shadow of Athena began to take form, I knew that my young hero and heroine would have an encounter with this culture, and part of their journey would take place on a Phoenician ship. After all, the Phoenicians sailed all over the Aegean. How could Arion and Marpessa not run into them? How would they communicate? Phoenician was a Semitic language related to Hebrew—not even close to Greek. And how would the Phoenicians have reacted to two young Greeks adrift in the world trying to make their way home? They would not have been welcoming, of that I was sure. Skilled sailors with superior ships, they would have inevitably safeguarded their navigating secrets from outsiders. Taking on Greek passengers would have been an anomaly for them. At the same time, they were not above making use of two able-bodied young people who could help with the incredibly difficult chores of navigating a huge trading ship across the seas in winter. With these thoughts in mind, I let the story unfold. 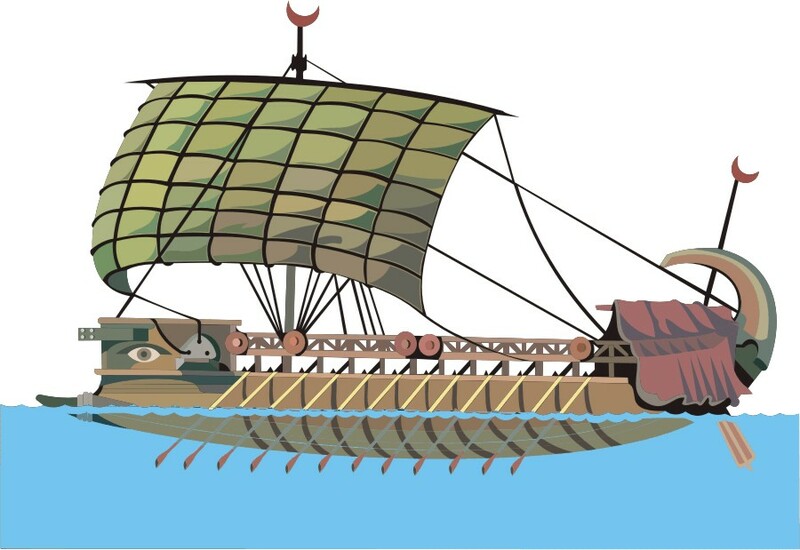 Unlike the early Greeks, the Phoenicians were willing to sail at night and even during the season of storms. They could navigate using the North Star. The navigational equipment on board their ships was superior and extremely well organized under the vigilant eye of the captain’s assistant, someone known as the “look-out man,” whose job it was to see that all the equipment was well maintained and well stowed. According to Xenophon, the Greek Ischomachus said, upon seeing a Phoenician ship, “I saw the largest amount of naval tackling separately disposed in the smallest stowage possible. For a ship, as you well know, is brought to anchor, and again got under way, by a vast number of wooden implements and of ropes, and sails the sea by means of a quantity of rigging, and is armed with a number of contrivances against hostile vessels, and carries about with it a large supply of weapons for the crew, and, besides, has all the utensils that a man keeps in his dwelling-house, for each of the messes.”* The look-out man knew precisely where each piece of equipment was and how to reach it even under the harshest conditions and the most violent storms. The practical Phoenicians did not keep anything extraneous or superfluous on their tightly run ships. In our story, Arion and Marpessa, desperate to reach home, offer their services in exchange for passage aboard a Phoenician ship. The Phoenicians decide to avail themselves of the Greek pair’s skills as their trading ship undertakes a challenging and dangerous journey. But they have lied about the ship’s destination: they are bound for the Black Sea instead of Greece. Marpessa is passing as a boy for her own safety. When the sharp-eyed look-out man is about to penetrate her disguise, Arion, all but chained to his rowing station, cannot protect her. And the two have uncovered too many arcane navigational secrets. What will be their fate once the Phoenicians decide they have outlived their usefulness?